"This island recipe springs from a little restaurant in the Keys. 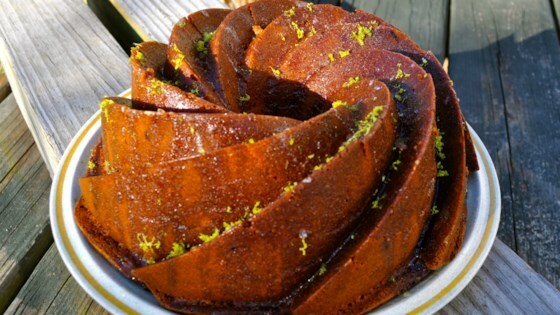 Key lime glazed pound cake whisks you away to that tropical paradise and is the perfect recipe for entertaining guests in the summer time." Preheat the oven to 325 degrees F (165 degrees C). Grease and flour a 10 inch tube pan. In a large bowl, beat 1 cup of butter, shortening and 2 cups of sugar until light and fluffy. Beat in the eggs, one at a time, blending each one thoroughly. Combine the flour and baking powder, stir into the batter alternating with the milk, vanilla and 1/2 cup of key lime juice. Pour into the prepared pan and smooth the top. Bake in the preheated oven until a knife inserted into the crown of the cake comes out clean, about 90 minutes. While the cake is baking, make the glaze in a small bowl. Stir together 1/4 cup sugar, 1/4 cup butter and key lime juice. When the cake is done, invert it onto a wire rack while still warm, but not straight out of the oven. Poke several times with a skewer or toothpick. Pour the glaze over the warm cake allowing it to seep into the holes. Allow the cake to cool completely before serving.